This well-made wok has a main handle made of bamboo. A hook is at the end of this handle is made for hanging your wok. 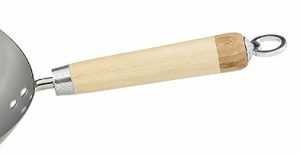 The small helper handle is also made of bamboo. 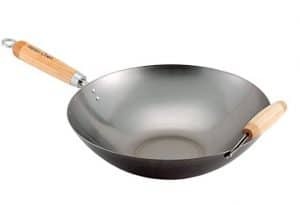 This wok is exceptionally well made and has an Amazon customer rating of 3.3 out of 5.0. Check Amazon here for availability and price.